On my way home from a course, I was walking a stretch which takes in part of the Basingstoke canal’s towpath. One stretch, between two locks, had been drained for maintenance and the muddy bed was covered in what looked like mussels. I decided to take a closer look and removed my pack so that I could climb down the bank. 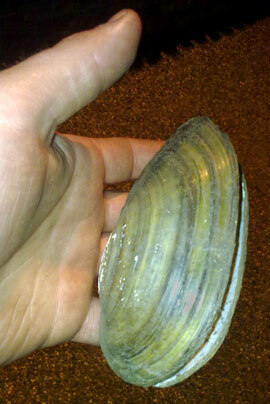 I found tens of empty freshwater mussel shells, some of which were of a considerable size. All of them had been scavenged by the time that I found them, but I was still amazed by the richness of the resource that I had been completely unaware of beforehand. Whether eating a filter-feeding shellfish from a stretch of water such as the canal would be a wise thing or not, is another matter. I’m just glad that I know that they’re there and that my eyes have been opened a little further. This entry was posted in The Woodlore Team on July 13, 2010 by Woodlore Team. Dear Dave C and others, please be aware that freshwater mussels in the Wye are a precious resource and conservationists have been fighting to protect them. It is actually illegal to even handle them without a licence let alone dine on them. Please conserve our heritage for years to come and stick to canned sardines. Have eaten them after cleansing them for a week and feeding them on oats; taste wise, well basically same as the water they came out of to me. I was walking along Bolton-Manchester canal today, I could see a large quantity of very large mussels on the bed of the canal. Some were live/occupied shells but some are empty. I have walked along this route for a few years but not noticed them before. I fished out one complete shell which was about 10inches wide. Just for the record, there are 5 river Stours in England: Kent (‘mine’), Suffolk, Dorset, Worcestershire and Warwickshire. Fresh water mussels found in England are all illigal to pick according to my sources. And if a trout take on muddy flavour imagine what a filter feeder wouls taste like. My son and I found some freshwater mussels just by the bridge through Hereford on the River Wye, we collected some and cooked them up later that day. I was fine but my son had severe nausea through the night and was very ill. Be warned. Some years ago, I contibuted to the filming of an episode of ‘Tracks’ with Ray on the Montgomery Canal, during which Ray found fresh water mussels (after all of 5 mins. looking!) also fresh water prawns in a lock overspill weir and freshwater sponges, a species I never even knew existed! An educational 2 days, to say the least! Im talking about the one in suffolk/essex – it runs through a lot of rich agricultural land and gets algal blooms caused by the nitrogen from all that fertiliser its like pea soup in the summer! Not sure id swim in one that flowed through industrial areas, but like you say, rivers do seem to be getting better generally and despite mink, pollution etc. otters etc seem to be doing well which is nice. Hey Sarah, I’m in Stourton, near Kinver. It is this part of the Stour that gets dirty as it has run through the Black Country industrial sites and picks up bad stuff. It is so much cleaner than it was 10 or 20 years ago though and the otter sightings are a testament to that. The tributaries are very clean and the wildlife in them is abundant here. The canal systems, although packed with industrial waste have loads of freshwater mussels in them and they reach a very good size. The water in the canals gets very clear if the longboats are quiet, the size of the carp and pike that you see is amazing. There are even a few foreign invaders like softshell and red-ear turtles. hi, ive seen mussels in the stour, there were some stranded on the muddy banks during a mess up with the weir system. i did try eating them after cleaning them for a few days in the waterbut. They were edible but not great- maybe they needed the smoke flavour from the fire, a gas hob doesnt qute cut it! I see quite a few when the canals are dredged around me and that’s in the West Mids and South Staffs area and going back thirty years. The canal systems are much healthier than they were a few years back, with huge diversity of fish and animals. Surprisingly I’ve also discovered otters in tributaries going into the dirty River Stour too. A good sign that attitudes are changing. Were they definitely living in those waters? No chance the empty shells had been thrown overboard a canal boat at some point in the past?